All of us in Fermoy Toastmasters are so excited and happy to extend an open and most cordial invitation to join our Circle Of Friends when we commence our new meeting season at 8.15 pm on this coming Tuesday, September 11th, in the tranquil riverside surroundings of the Fermoy Youth Centre, and every alternate Tuesday thereafter. 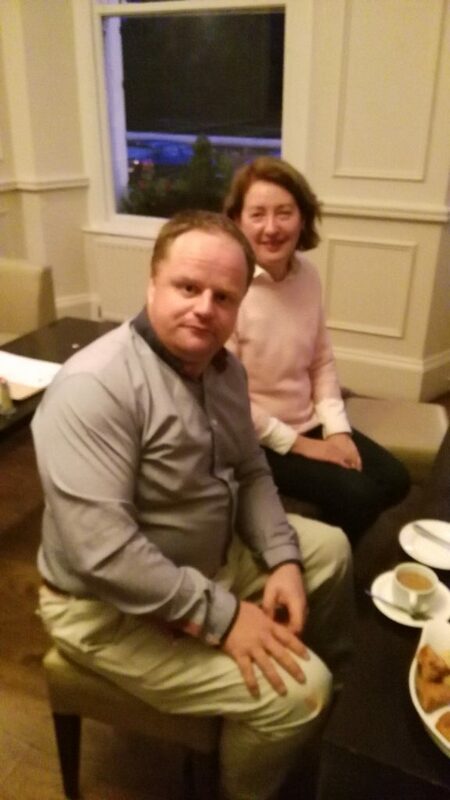 Our most charming, gracious and ever friendly Club President Eilish Ui Bhriain joins with all of us in looking forward to the very first of many memorably pleasant and entertaining meetings in the months ahead. Already on the evening of August 28th, an informal gathering took place in the foyer of the Grand Hotel Fermoy to honour our cherished friend and outstanding club member over the years, Brian O’Farrell of Mitchelstown on the occasion of his forthcoming marriage to the lovely Michelle Murphy of Cork, with our President Eilish making a presentation on behalf of us all of a stylish electric lantern symbolising the illumination and warmth of mutual friendship and goodwill together with our heartiest congratulations and best wishes for very many happy and joyful years ahead. What a glorious summer it was of endless sunshine and cloudless blue skies with the pleasure of looking out the window each morning to see everywhere once again bathed in the most brilliant warm sunshine and the grasses scorched brown with the heat and the dryness. Then too for an extraordinary month our television screens were filled with the drama and excitement and the sense of anticipation of the unexpected always just about to happen in the FIFA World Cup so magnificently well staged by the Russian Government and people. The skill and precision displayed by the best players on earth was dazzling. Excellence is always fascinating. Watching the unfolding drama of immense crowds of people passionately cheering and singing their hearts out in support of their national teams trying to control, pass and shoot the chequered ball into the back of the net all carrying the hopes and dreams of millions made for a riveting spectacle. Through the marvel of satellite television it was great to be a part of it without ever having to leave our living rooms. Ireland’s not being there did not in any way lessen the drama for it was just so thrilling to see people so passionately celebrating the pure joy of life. Just as we do in our own perhaps quieter but no less joyful way in Toastmasters. Brian O’Farrell pictured with Mary Whelan on the evening of the club presentation to mark the occasion of his marriage. Then too very recently we had the visit to Ireland of Pope Francis: under a grey sky and braving sometimes inclement weather many tens of thousands gathered so enthusiastically in the Phoenix Park Dublin hoping to catch glimpse of the Pontiff, among them a number of our club members and our own dear friends including Johanna Hegarty, Michael Sheehan, John Quirke and Frank O’Driscoll, the latter having said at one of our meetings earlier in the year that having missed the visit of John Paul II back in 1979 he was determined to be there this time when the Pope-mobile and the smiling and waving figure in white rolled by. All came back delighted to have been part of this great historic occasion and having shared in the experience of a uniquely uplifting moment of grace and blessing. Now we all look forward to our coming together next week for the first time in our new season in the spirit of friendship and cheer that makes you feel so good and pleasantly fulfilled to be a part of. In this mellow time of the year the sunlight takes on a diffuse gentleness. After the first hint of a nighttime chill you push back the curtains to reveal the windows misted over. Jet trails do not burn away instantly as they did in the fiery intensity of mid-summer and instead linger unhurriedly in the sky. The changing leaves are beginning to gently flutter to the ground; apples are blushing with ripening goodness and the swallows wheeling and twittering overhead in these final weeks readying their wings for their long journey south to lands of unbroken summertime. And now as autumn spreads across the land it is time to come inside to enter the warm and brightly convivial atmosphere of the meeting room, to greet cherished friends, share stories of lazy summer days spent in garden or beach or holiday memories of romantic faraway places with the exchange of firm handshakes and genial words, the air soon filled with the buzz of chatter and radiant flashes of humour and laughter. We truly are a family close in shared feeling and warmth of heart. So we all come together in an atmosphere of delightful affability and renewed joy. One of the most special pleasures at the first meeting of the new season as at all of our meetings is the opportunity to welcome first-time guests and visitors. Every journey in Toastmasters begins with that first evening arriving as a guest: curious, interested, eager, not sure of what this is really all about, but instantly put at ease and assured that they do not have to say anything, unless they wish to later at the appropriate time. That first encounter can shape the progress of years to follow. For it is the beginning of a great journey of discovery into a new world of personal growth and advancement, into a brilliant source of enjoyment and inspiration and the making of close and very special friends in a spirit of mutual support and encouragement. To join Toastmasters is one of the best, the happiest and most enjoyable things can anyone can ever do. Brian O’Farrell with officers and members of Fermoy Toastmasters gathered to congratulate him on his recent marriage. 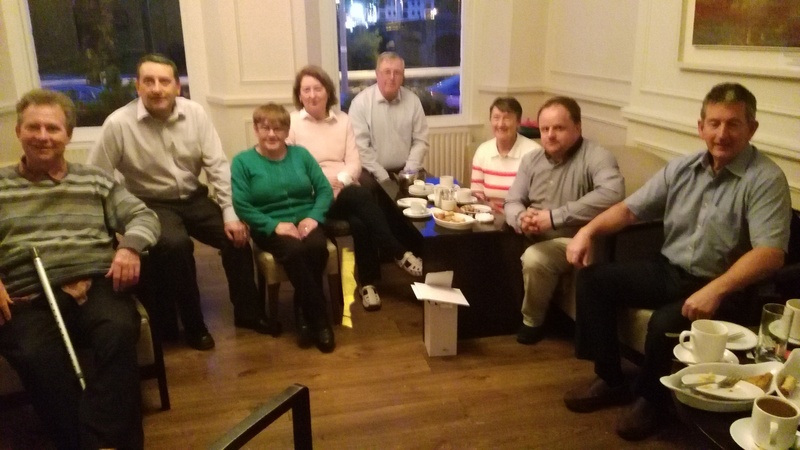 From right:- Frank O’Driscoll, Brian O’Farrell, Club President Eilish Ui Bhriain, Jerry Hennessy, Mary Whelan, Johanna Hegarty, Fanahan Colbert and Kevin Walsh. The satisfaction of being with some of the very loveliest of people for the next two hours to share their wisdom and experience, to listen as they utilise their talents of mind and spirit in a bracing and stimulating way for an active mind ensures a healthy body. We learn and refresh our skills in the arts of self-expression and in the running of meetings within a structure that is linked-together in a carefully balanced way so that everyone has their chance to make a contribution and where all are enriched and inspired by what they hear and enjoy. Toastmasters is far more about listening than speaking, about gaining through giving for it is in the generosity of everyone’s time and energies that we all receive the blessings of personal development and the great fulfilment of doing something good . You learn the beautiful skill of being able to say so very much with as few words as possible and as briefly as possible. The impromptu topics session gradually involves everyone using and speaking their minds. There is a great emphasis on positive feedback so that every short set speech receives a thoughtful and helpful evaluation from another member. The focus is always on praise for all that has been achieved and pointing the way to where greater progress can be made. In a world where so many want to break us down, here in Toastmasters we are together in the pleasure of each other’s company to explore and share our potential and to expand our personal horizons to make a better and happier life. Toastmasters cannot fail to deliver on its promise to all who are willing to give it a go and make a very modest effort that sends you away feeling elated and with a lovely inner glow for having come and taken part and shared in the laughter and joy of friends. Participation makes all of us winners. As the autumn shadows fall, together we produce fresh colourful blooms of hope, promise and enjoyment in the garden of life. This year we will be forging ahead with the new Pathways online system currently being rolled out by World Headquarters which brings exciting new challenges and opportunities for all. Let us begin our journey together on this coming Tuesday, September 11th, at 8.15 pm at the Fermoy Youth Centre as we look forward to the pleasure of seeing you all. For further information, please contact Mary Whelan at 087 7971006 or Kevin Walsh at 058 60100 or log on to our mobile-friendly website toastmastersfermoy.com or find us on Twitter @ FermoyT.